The Tatars are people of Turkic origin living mainly in Russia but also in Poland the Baltic states and several other countries. Russian Tatars number approximately six million, and are the second largest ethnic group. About five million live in diaspora with communities in North America, Germany and Turkey. Most Russian Tatars belong to the Sunni branch of Islam. The name is believed to derive from that of a fifth century Mongolian tribe. In the thirteenth century, under the leadership of Batu Khan the Tatars overran large parts of Russia, including Siberia, often called Tartary. Taking part in the Mongol invasion of Europe they attacked Hungary and Germany before settling in Voga Bulgaria. They established the Golden Horde. Until the fifteenth century, the Tatar territory was more or less a single polity. Faced with Ottoman expansion, the empire then disintegrated into a series of small khanates, some of which became vassals of the Ottomans. Many Tatars inter-married with Russian families, including the nobility. Many assimilated into Russian society and achieved prominent positions in government and in the military. The last independent Tatar state to be incorporated into imperial Russia was the Crimea, which was annexed in 1783. Some Crimean Tatars were accused of collaboration with Nazi Germany during World War II, and sent into internal exile within the Soviet Union. There is no evidence that this accusation was justified and the deportation was later denounced by Nikita Khrushchev. Some have subsequently returned to the Crimea, others have migrated elsewhere. Volga Bulgaria became Tartarstan, a Soviet republic in 1920 and a semi-independent state within the Russian Federation in 1992. Tatars have proven remarkable adept at assimilating into host societies while retaining a sense of their own identity and pride in their heritage. Having spread across the world, they have contributed to multiple cultures, bridged different civilizations and illustrate the inter-connectivity of humans around the globe. Tatar expansion and conquest opened up channels of communication, made Europeans more aware of the world beyond their borders, enabled trade and created bonds and links between diverse populations. Tatars (Tatar: Tatarlar/Татарлар), sometimes spelled Tartars, refers to ethnic group mainly inhabiting Russia, Kazakhstan, Uzbekistan, Ukraine, Kyrgyzstan, Bulgaria, Romania, Lithuania, and Poland. They collectively numbered more than five million in the late twentieth century. Many of them speak the Tatar language, a member of the Turkic language group, and they have been referred to as a Turkic people. The original Ta-ta inhabited the north-eastern Gobi in the fifth century and, after subjugation in the ninth century by the Khitans, migrated southward. In the twelfth century, they were subjugated by the Mongol Empire under Genghis Khan. Under the leadership of his grandson Batu Khan, they moved westwards, driving with them many stems of the Turkic Ural-Altayans towards the plains of Russia. In Europe, they were assimilated by the local populations or their name spread to the conquered peoples: Kipchaks, Volga Bulgars, Alans, Kimaks and others; and elsewhere with Finno-Ugric speaking peoples, as well as with remnants of the ancient Greek colonies in the Crimea and Caucasians in the Caucasus. Tatars of Siberia are survivors of the Turkic population of the Ural-Altaic region, mixed to some extent with the speakers of Uralic languages, as well as with Mongols. Later, each group adopted Turkic languages and many adopted Islam. At the beginning of twentieth century, most of those groups, except the Volga Tatars and Crimean Tatars adopted their own ethnic names and now are not referred to as Tatars, being Tatars or Tartars only in historical context. Now the name Tatars is generally applied to two ethnic groups: Volga Tatars (or simply Tatars) and Crimean Tatars. However, some indigenous peoples of Siberia are also traditionally named Tatars, such as Chulym Tatars. those of Crimea, Bulgaria, European Russia and Western Siberia, Lithuania, Moldova, Belarus, Poland, Romania and Turkey. and those of Eastern Siberia (in historical context). Due to the very loose utilization of the name Tatar, current day Tatars comprise a spectrum of physical appearance, ranking from Mongoloid to Caucasoid. As to the original Tatars from Mongolia, they most likely shared characteristics with the Mongol invaders from Central Asia. 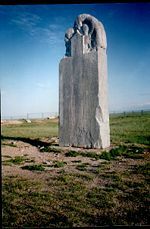 The name Tatar initially appeared amongst the nomadic Turkic peoples of northeastern Mongolia in the region around Lake Baikal in the beginning of the fifth century. These people may have been related to the Cumans or the Kipchaks. The Chinese term is Dada and is a comparatively specific term for nomads to the north, emerging in the late Tang. Other names include Dadan and Tatan. As various of these nomadic groups became part of Genghis Khan's army in the early thirteenth century, a fusion of Mongol and Turkic elements took place, and the invaders of Rus and Hungary became known to Europeans as Tatars (or Tartars). After the breakup of the Mongol Empire, the Tatars became especially identified with the western part of the empire, which included most of European Russia and was known as the Golden Horde. The form Tartar has its origins in either Latin or French, coming to Western European languages from the Turkish and Persian Tātār. From the beginning the extra r was present in the Western forms, and according to the Oxford English Dictionary this was most likely due to an association with Tartarus (Hell in Greek mythology), though some claimed that the name Tartar was in fact used amongst the Tatars themselves. Nowadays Tatar is usually used to refer to the people, but Tartar is still almost always used for derived terms such as tartar sauce or steak tartare. Some ethnic groups in the Soviet Union after the policy of Furkinland, such as the Volga Tatars (or simply Tatars), Crimean Tatars, Chulym Tatars, and groups such as the Lipka Tatars (other peoples also switched their Russian names to "Tatar" to promote their desire for self-determination). Tatars - Tatarlar or Татарлар. In modern English only Tatar is used to refer to Eurasian Tatars; Tartar has offensive connotations as a confusion with the Tartarus of Greek mythology, due in part to the popular association of the ferocity of the Mongol tribes with the Greek sub-underworld. In Europe the term Tartar is generally only used in the historical context for Mongolian people who appeared in the thirteenth century (the Mongol invasions) and assimilated into the local population later. Volga Tatars live in the central and eastern parts of European Russia and in western Siberia. In today's Russia the term Tatars is used to describe Volga Tatars only. During the census of 2002, Tatars, or Volga Tatars, were officially divided into common Tatars, Astrakhan Tatars, Keräşen Tatars, and Siberian Tatars. Other ethnic groups, such as Crimean Tatars and Chulyms, were not officially recognized as a part of the multi-ethnic Tatar group and were counted separately. During the eleventh-sixteenth centuries, most Turkic tribes lived in what is now Russia and Kazakhstan. The present territory of Tatarstan was inhabited by the Volga Bulgars who settled on the Volga in the eighth century and converted to Islam in 922 during the missionary work of Ahmad ibn Fadlan. On the Volga, the Bulgars mingled with Scythian and Finno-Ugric speaking peoples. After the Mongol invasion, Bulgaria was defeated, ruined and incorporated in the Golden Horde. Much of the population survived, and there was a certain degree of mixing between it and the Kipchak Tatars of the Horde during the ensuing period. The group as a whole accepted the ethnonym "Tatars" (finally in the end of nineteenth century; although the name Bulgars persisted in some places; the majority identified themselves simply as the Muslims) and the language of the Kipchaks; on the other hand, the invaders eventually converted to Islam. As the Horde disintegrated in the fifteenth century, the area became the territory of the Kazan khanate, which was ultimately conquered by Russia in the sixteenth century. There is some debate among scholars about the extent of that mixing and the "share" of each group as progenitors of the modern Kazan Tatars. It is relatively accepted that demographically, most of the population was directly descended from the Bulgars. Nevertheless, some emphasize the contribution of the Kipchaks on the basis of the ethnonym and the language, and consider that the modern Tatar ethnogenesis was only completed upon their arrival. Others prefer to stress the Bulgar heritage, sometimes to degree of equating modern Kazan Tatars with Bulgars. They argue that although the Volga Bulgars had not kept their language and their name, their old culture and religion - Islam - have been preserved. According to scholars who espouse this view, there was very little mixing with Mongol and Turkic aliens after the conquest of Volga Bulgaria, especially in the northern regions that ultimately became Tatarstan. Some voices even advocate the change of the ethnonym from "Tatars" to "Bulgars" - a movement known as Bulgarism. In the 1910s they numbered about half a million in the Kazan Governorate (Tatarstan, the Kazan Tatars' historical motherland), about 400,000 in each of the governments of Ufa, 100,000 in Samara and Simbirsk, and about 30,000 in Vyatka, Saratov, Tambov, Penza, Nizhny Novgorod, Perm and Orenburg. Some 15,000 belonging to the same stem had migrated to Ryazan, or had been settled as prisoners in the sixteenth and seventeenth centuries in Lithuania (Vilnius, Grodno and Podolia). Some 2000 resided in Saint Petersburg, where they were mostly employed as coachmen and waiters in restaurants. In Poland they constituted one percent of the population of the district of Płock. Later they were never counted as separate group of the Tatars. The Kazan Tatars speak a Turkic language (with a big complement of Russian and Arabic words; see Tatar language). They have been described as generally middle-sized, broad-shouldered, and the majority have brown and green eyes, a straight nose and salient cheek bones. Because their ancestors number not only Turkic peoples, but Finno-Ugric and Eastern Iranian peoples as well, many Kazan Tatars tend to have Caucasoid faces. Around 33.5 percent belong to Southern Caucasoid, 27.5 percent to Northern Caucasoid, 24.5 percent to Lapponoid and 14.5 percent to Mongoloid. Most Kazan Tatars practice Sunni Islam. Before 1917 in Russia, polygamy was practiced only by the wealthier classes and was a waning institution. The Bashkirs who live between the Kama and Ural speak the Bashkir language, which is similar to Tatar, and have converted to Sunni Islam. Because it is understandable to all groups of Russian Tatars, as well as to the Chuvash and Bashkirs, the language of the Volga Tatars became a literary one in the fifteenth century (İske Tatar tele). (However, being written in Arabic alphabet, it was spelled variously in the different regions). The old literary language included a lot of Arabic and Persian words. Nowadays the literary language includes European and Russian words instead of Arabic. Volga Tatars number nearly eight millions, mostly in Russia and the republics of the former Soviet Union. While the bulk of the population is to be found in Tatarstan (nearly two million) and neighboring regions, significant numbers of Kazan Tatars live in Central Asia, Siberia and the Caucasus. Outside of Tatarstan, urban Tatars usually speak Russian as their first language (in cities such as Moscow, Saint-Petersburg, Nizhniy Novgorod, Tashkent, Almaty, and cities of the Ural and western Siberia) and other languages in a worldwide diaspora. Hahn describes most Muslims in Tartarstan as belonging to the "more moderate Hanafi school" and as Russianified, urbanized and secularized. Commenting that they are the second largest nationality in the Russian Federation, he notes that they "represent the greatest potential danger to the future of the Russian federal state" if they substitute pursuit of independence for autonomy. A significant number of Tatars emigrated during the Russian Civil War, mostly to Turkey and Harbin, China, but resettled to European countries later. Some of them speak Turkish at home., there are still 51,000 Tatars living in Xinjiang province. Tatars live in Russia's Kirov Oblast and Tatarstan. Tatars live in Russia's Perm Krai. Some of them also have an admixture of Komi blood. Some Tatars were forcibly Christianized by Ivan the Terrible during the sixteenth century and later in the eighteenth century. Some scientists suppose that Suars were ancestors of the Keräşen Tatars, and they had been converted to Christianity by Armenians in the sixth century, while they lived in the Caucasus. Suars, like other tribes (which later converted to Islam) became Volga Bulgars and later the modern Chuvash (mostly Christians) and Tatars (mostly Muslims). Keräşen Tatars live all over Tatarstan and in Udmurtia, Bashkiria and Chelyabinsk Oblast. Some of them did assimilate among Chuvash and Tatars with Sunni Muslim self-identification. Eighty years of atheistic Soviet rule made Tatars of both confessions not as religious as they were. As such, differences between Tatars and Keräşen Tatars now is only that Keräşens have Russian names. Some Turkic (Kuman) tribes in Golden Horde were converted to Christianity in the thirteenth and fourteenth centuries (Catholicism and Nestorianism). Some prayers, written in that time in the Codex Cumanicus, sound like modern Keräşen prayers, but there is no information about the connection between Christian Kumans and modern Keräşens. Tatars who became Cossacks (border keepers) and converted to Russian Orthodoxy. They live in the Urals, the Russian border with Kazakhstan during the seventeenth-eighteenth century. The biggest Nağaybäk village is Parizh, Russia, named after the French capital Paris, due Nağaybäk's participation in Napoleonic Wars. Like Noğaybaqs, although they are Sunni Muslims. Some Tiptär Tatars speak Russian or Bashkir. There are three dialects: Eastern, Central, Western. The Western dialect (Misher) is spoken mostly by Mishärs, the Middle dialect is spoken by Kazan and Astrakhan Tatars, and the Eastern (Siberian) dialect is spoken by some groups of Tatars in western Siberia. Middle Tatar is the base of literary Tatar Language. The Middle dialect also has subdivisions. Mişär Tatars (or Mishers) are a group of Tatars speaking a dialect of the Tatar language. They are descendants of Kipchaks in the Middle Oka River area and Meschiora where they mixed with the local Slavic and Finno-Ugric tribes. Nowadays they live in Tambov, Penza, Ryazan, Nizhegorodskaya oblasts of Russia and in Bashkortostan and Mordovia. They lived near and along the Volga River, in Tatarstan. The Western Tatars have their capital in the town of Qasím (Kasimov in Russian transcription) in Ryazan Oblast, with a Tatar population of 1100. The Astrakhan Tatars (around 80,000) are a group of Tatars, descendants of the Astrakhan Khanate's agricultural population, who live mostly in Astrakhan Oblast. For the 2000 Russian census 2000, most Astrakhan Tatars declared themselves simply as Tatars and few declared themselves as Astrakhan Tatars. A large number of Volga Tatars live in Astrakhan Oblast and differences between them have been disappearing. The Astrakhan Tatars are further divided into the Kundrov Tatars and the Karagash Tatars. The latter are also at times called the Karashi Tatars. The Astrakhan Tatars number about 10,000 and are, with the Kalmyks, all that now remains of the once so powerful Astrakhan empire. They also are agriculturists and gardeners; while some 12,000 Kundrovsk Tatars still continue the nomadic life of their ancestors. The Astrakhan Tatars also assimilated the Agrzhan. Finland (since 1804): (mostly Mişärs) - nineteenth century - from a group of some 20 villages in the Sergach region on the Volga River. The Crimean Tatars constituted the Crimean Khanate which was annexed by Russia in 1783. The war of 1853 and the laws of 1860-1863 and 1874 caused an exodus of the Crimean Tatars. Those of the south coast, mixed with Scyth, Greeks and Italians, were well known for their skill in gardening, their honesty, and their work habits, as well as for their fine features. The mountain Tatars closely resemble those of Caucasus, while those of the steppes - the Nogais - are decidedly of a mixed origin with Turks and Mongols. During World War II, the entire Tatar population in Crimea fell victims to Stalin's oppressive policies. In 1944 they were accused of being Nazi collaborators and deported en masse to Central Asia and other lands of the Soviet Union. Many died of disease and malnutrition. Since the 1980s late, about 250,000 Crimean Tatars have returned to their homeland in the Crimea . 'Tatar dance' - (Crimean) Tatar soldier (left) fighting with the soldier of the Polish-Lithuanian Commonwealth (right). This was a common occurrence until the eighteenth century. After Tokhtamysh was defeated by Tamerlane, some of his clan sought refuge in Grand Duchy of Lithuania. They were given land and nobility in return for military service and were known as Lipka Tatars. They are known to have taken part in the Battle of Grunwald. Another group appeared in Jagoldai Duchy (Lithuania's vassal) near modern Kursk in 1437 and disappeared later. Islam spread in Belarus from the 14th to the 16th century. The process was encouraged by the Lithuanian princes, who invited Tatar Muslims from the Crimea and the Golden Horde as guards of state borders. Already in the 14th century the Tatars had been offered a settled way of life, state posts and service positions. By the end of the 16th century over 100,000 Tatars settled in Belarus and Lithuania, including those hired to government service, those who moved there voluntarily, prisoners of war, etc. Tatars in Belarus generally follow Sunni Hanafi Islam. Some groups have accepted Christianity and been assimilated, but most adhere to Muslim religious traditions, which ensures their definite endogamy and preservation of ethnic features. Interethnic marriages with representatives of Belarusian, Polish, Lithuanian, Russian nationalities are not rare, but do not result in total assimilation. Originating from different ethnic associations, Belarusian (and also Polish and Lithuanian) Tatars back in ancient days lost their native language and adopted Belarusian, Polish and Russian. However, the liturgy is conducted in the Arabic language, which is known by the clergymen. There are an estimated 5,000-10,000 Tatars in Belarus. From the thirteenth to seventeenth centuries various groups of Tatars settled and/or found refuge within the Polish-Lithuanian commonwealth. This was promoted especially by the Grand Dukes of Lithuania, because of their deserved reputation as skilled warriors. 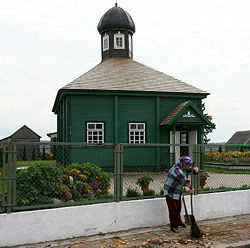 The Tatar settlers were all granted with szlachta (~ nobility) status, a tradition that was preserved until the end of the Commonwealth in the eighteenth century. They included the Lipka Tatars (thirteenth-fourteenth centuries) as well as Crimean and Nogay Tatars (fifteenth-sixteenth centuries), all of which were noticeable in Polish military history, as well as Volga Tatars (sixteenth-seventeenth centuries). They all mostly settled in the Grand Duchy of Lithuania, lands that are now in Lithuania and Belarus. Various estimates of the number of Tatars in the Commonwealth in the seventeenth century range from 15,000 persons to 60 villages with mosques. Numerous royal privileges, as well as internal autonomy granted by the monarchs allowed the Tatars to preserve their religion, traditions and culture over the centuries. The Tatars were allowed to intermarry with Christians, a thing uncommon in Europe at the time. The May Constitution of 1791 gave the Tatars representation in the Polish Sejm. Although by the eighteenth century the Tatars adopted the local language, the Islamic religion and many Tatar traditions (e.g. the sacrifice of bulls in their mosques during the main religious festivals) were preserved. This led to formation of a distinctive Muslim culture, in which the elements of Muslim orthodoxy mixed with religious tolerance and a relatively liberal society. For instance, the women in Lipka Tatar society traditionally had the same rights and status as men, and could attend non-segregated schools. 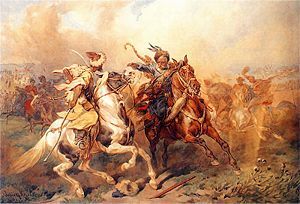 About 5500 Tatars lived within the inter-war boundaries of Poland (1920-1939), and a Tatar cavalry unit had fought for the country's independence. The Tatars had preserved their cultural identity and sustained a number of Tatar organizations, including a Tatar archives, and a museum in Wilno (Vilnius). The Tatars suffered serious losses during World War II and furthermore, after the border change in 1945 a large part of them found themselves in the Soviet Union. It is estimated that about 3000 Tatars live in present-day Poland, of which about 500 declared Tatar (rather than Polish) nationality in the 2002 census. There are two Tatar villages (Bohoniki and Kruszyniany) in the north-east of present-day Poland, as well as urban Tatar communities in Warsaw, Gdańsk, Białystok, and Gorzów Wielkopolski. Tatars in Poland sometimes have a Muslim surname with a Polish ending: Ryzwanowicz. The Tatars were relatively noticeable in the Commonwealth military as well as in Polish and Lithuanian political and intellectual life for such a small community. In modern-day Poland, their presence is also widely known, due in part to their noticeable role in the historical novels of Henryk Sienkiewicz, which are universally recognized in Poland. A number of Polish intellectual figures have also been Tatars, e.g. the prominent historian Jerzy Łojek. 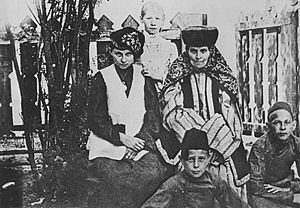 A small community of Polish speaking Tatars settled in Brooklyn, New York City in the early 1900s. They established a mosque that is still in use today. Tatars were present on the territory of today's Romania since the 13th century. According to the 2002 census, 24,000 people declared their nationality as Tatar, most of them being Crimean Tatars living in Constanţa County in the region of Dobruja. The Crimean Tatars were colonized there by the Ottoman Empire beginning with the 17'th Century. These are Tatars who inhabit the upper Kuban, the steppes of the lower Kuma and the Kura, and the Araks. In the nineteenth century they numbered about 1,350,000. This number includes a number of Tatar oil workers who came to the Caucasus from the Middle Volga in the end of the nineteenth century. Now this term is used to describe Tatars, settled in Caucasus. Other explanations, like followers, can be found only in historical context. The Nogais on the Kuma River show traces of a mixture with Kalmyks. They are nomads, supporting themselves by cattle-breeding and fishing; a few are agriculturists. Today Nogais is an independent ethnos, living in the North of Dagestan, where they lived after Nogai Horde's defeating in war against Russia and settling Kalmyks in their lands in seventeenth century. Nogais was replaced to Black Lands in the North of Daghestan. Another part merged with Kazakhs. In sixteenth century Nogais supported Crimean Khanate and Ottoman Empire, but sometimes robbed Crimean, Tatar and Bashkir lands, although their rulers supported them. In sixteenth-seventeenth century some defensive walls was constructed in modern Tatarstan and Samara Oblast. 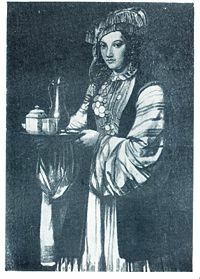 In the 1770s and 1780s Catherine the Great resettled approximately 120,000 Nogais from Bessarabia and areas northeast of the Sea of Azov to the Kuban and the Caucasus. One of the Tatar national heroes, Söyembikä, was Nogai. Some groups of Nogais emigrated to Middle Volga, where they have been assimilated by Volga Tatars (in terms of language). The Siberian Tatars were estimated (1895) at 80,000 of Turkic stock, and about 40,000 had Uralic or Ugric ancestry. They occupy three distinct regions—a strip running west to east from Tobolsk to Tomsk—the Altay and its spurs—and South Yeniseisk. They originated in the agglomerations of Turkic stems that, in the region north of the Altay, reached some degree of culture between the 4th and the 5th centuries, but were subdued and enslaved by the Mongols. There are some 500,000 Tatars in Siberia, but 300,000 of them are Volga Tatars who settled in Siberia during periods of colonization. The Baraba Tatars take their name from one of their stems (Barama). After a strenuous resistance to Russian conquest, and much suffering at a later period from Kyrgyz and Kalmyk raids, they now live by agriculture—either in separate villages or along with Russians. After colonization of Siberia by Russians and Volga Tatars, Baraba Tatars used to call themselves people of Tomsk, later Moslems, and came to call themselves Tatars only in 20th century. They numbered at least 150,000 in 1990. Quite loosely, to designate any of the Muslim tribes whose ancestors may have spoken Uralic or Altaic languages. Thus some writers talk of the Manchu Tatars. In a more restricted sense, to designate Muslim Turkic-speaking tribes, especially in Russia, who never formed part of the Seljuk or Ottoman Empire, but made independent settlements and remained more or less cut off from the politics and civilization of the rest of the Islamic world. Tatars are partly descendants of the Volga Bulgars. Volga Bulgars were a mixed people, whose ancestors may have included speakers of Scythian, Turkic and Finno-Ugric languages. After coming to the Middle Volga, Bulgars mixed with Finno-Ugric speaking tribes. Bashkirs speak a language very similar to Tatar language. Nowadays, Bashkortostan's officials pursue a policy of forced "Bashkirization" of Tatars. However, the number of Tatars in Bashkortostan is almost as high as the number of Bashkirs in their own republic. The 2002 Russian Federation census lists 990,000+ people as self identifying as Tatars in Bashkortostan compared to 1,221,302 self identifying Bashkir. Tatars have proven remarkable adept at assimilating into host societies while retaining a sense of their own identity and pride in their heritage. The Tartars, who have spread across the world, have contributed to multiple cultures, bridged different civilizations and illustrates the inter-connectivity of humans around the globe. The Great Khans whom the Tartars served had a vision of a unified world, under a single law code in which merit would earn recognition, diversity would flourish and trade would bind people together. This experiment did not survive because the empire imploded due to succession disputes and rivalries; but while it did huge tracts of the planet experienced the Pax Mongolica, peace and stability. It was said that a virgin carrying a sack of gold could ride unharmed from one border of the empire to the other. Tatar expansion and conquest opened up channels of communication, made Europeans more aware of the world beyond their borders, enabled trade and created bonds and links between diverse populations. ↑ Allen J. Frank. 1998. Islamic historiography and "Bulghar" identity among the Tatars and Bashkirs of Russia. (Leiden, NL: Brill. ISBN 9789004110212), 6. ↑ Tatars. Xacitarxan. Retrieved January 24, 2009. ↑ Gordon M. Hahn. 2007. Russia's Islamic threat. (New Haven, CT: Yale University Press. ISBN 9780300120776), 174. ↑ Regional Autonomy for Minority Peoples. Ministry of Foreign Affairs, Peoples Republic of China. Retrieved January 24, 2009. ↑ James Stuart Olson. 1994. An ethnohistorical dictionary of the Russian and Soviet empires. (Westport, CT: Greenwood Press. ISBN 9780313274978), 55. ↑ The Encyclopaedia britannica; a dictionary of arts, sciences, literature and general information, 1911 ed. (New York, NY: Encyclopaedia Britannica), 448. ↑ Ronald Wixman. 1984. The peoples of the USSR: an ethnographic handbook. (Armonk, NY: M.E. Sharpe. ISBN 9780873322034), 15. ↑ Country profile: Ukraine. BBC News. Retrieved January 24, 2009. ↑ John R. Staples, 2000. "On Civilizing the Nogais": Mennonite-Nogai Economic Relations, 1825-1860. The Mennonite Quarterly Review. Retrieved January 24, 2009. ↑ 2002 Census. Russian Federation. Retrieved January 24, 2009. ↑ Harold Lamb, 1927, Genghis Khan: The Emperor of All Men. (London, UK: Butterworth), 106. archive.org. Retrieved January 24, 2009. Fakhroutdinov, Ravil. 2004. History of the Tatars. Kazan, RU: Magarif Publishing House. ISBN 9785776112508. Fisher, Alan W. 1978. The Crimean Tatars. Studies of nationalities in the USSR. Stanford, CA: Hoover Institution Press. ISBN 9780817966614. Frank, Allen J. 1998. Islamic historiography and "Bulghar" identity among the Tatars and Bashkirs of Russia. (Social, economic, and political studies of the Middle East and Asia, v. 61.) Leiden, NL: Brill. ISBN 9789004110212. Hahn, Gordon M. 2007. Russia's Islamic threat. New Haven, CT: Yale University Press. ISBN 9780300120776. Olson, James Stuart. 1994. An ethnohistorical dictionary of the Russian and Soviet empires. Westport, CT: Greenwood Press. ISBN 9780313274978. Parker, Edward Harper. 1969. A thousand years of the Tartars. New York, NY: Barnes & Noble. ISBN 9780389010371. Schildgen, Brenda Deen. 2001. Pagans, Tartars, Moslems, and Jews in Chaucer's Canterbury tales. Gainesville, FL: University Press of Florida. ISBN 9780813021072. Vásáry, István. 2007. Turks, Tatars and Russians in the 13th-16th centuries. Aldershot, UK: Burlington, VT. ISBN 9780754659297. Wixman, Ronald. 1984. The peoples of the USSR: an ethnographic handbook. Armonk, NY: M.E. Sharpe. ISBN 9780873322034. All links retrieved November 17, 2015. The Origins of the Volga Tatars. Crimean Tatars. By H. B. Paksoy. This page was last modified on 17 November 2015, at 15:56.